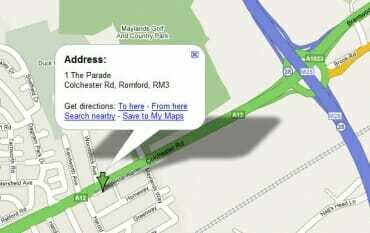 Our location, in Romford, and near Brentwood Essex. As you can see, we’re based two minutes from Junction 28 of the M25, off the A12. Really easy to get to, and with car parking of course, like any good cosmetic dental practice should do! We’re the second left turning after you leave the M25 roundabout headed into London, and then continue parallel to the A12 in the same direction – we’re the last building on the left before the turning back onto the A12. We serve a large client base locally in Romford and Brentwood, and clients drive to us from wilder parts of Essex, Herts, North London and even Kent. We’re half an hour by train from London Liverpool Street, to the local train station of Harold Wood.